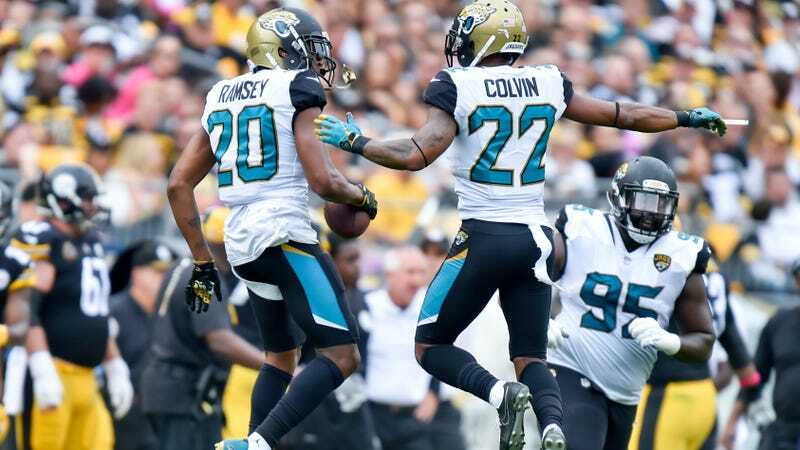 The 3-2 Jaguars have already matched their win total from all of last season, after humiliating Ben Roethlisberger and the Steelers today. Big Ben had an abysmal game against Jacksonville’s defense as he threw five picks for the first time ever in a 30-9 loss. Here are four of them. Wow, that’s a good dive from Jalen Ramsey. No shame there after a solid athletic play, even if the throw seemed a little weak. 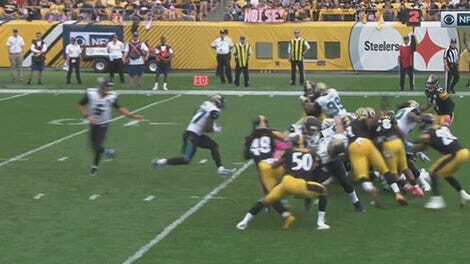 Hm, maybe Ben didn’t see Telvin Smith standing right there. Or maybe he was confused about which team Smith plays for. Well, if anyone can make a catch with three defenders around him, it’s Antonio Brown. Nice idea, at least. Okay, where the hell is Landry Jones?